The holidays are a time for giving, family, eating boatloads of food, and generally giving a damn about your fellow man. 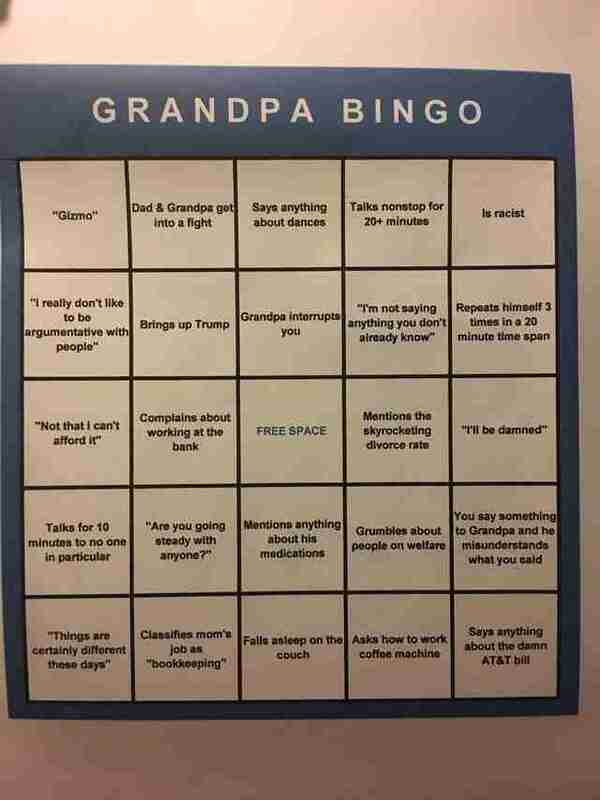 They're also a time where you just have to grit your teeth and put up with relatives. Reddit user BitchyTyphoon has put together a beautiful game that manages to encapsulate everything about how you just put up with family despite the fact that you wouldn't put up with the same crap from a complete stranger. 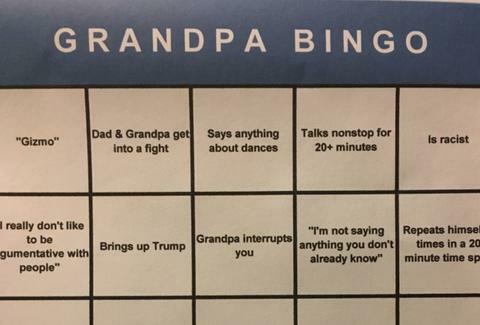 BitchyTyphoon has created "Grandpa Bingo," which is specific to her grandpa, but you can probably use it for someone you know. There are so many highlights it's hard to choose just one, like the incredible specificity of "I really don't like to be argumentative with people" or the beautiful succinctness of "is racist" and "Gizmo." "I'm glad people are finding it funny," she tells Thrillist. "My family likes to tease one another, but it's all in good fun." And yes, according to the thread on Reddit titled "Had to make Christmas interesting somehow...," she did actually play the game. "My sister ended up winning five in a row first," she said in the thread, "but I almost checked off every box."